EasyEDA provides a real time DRC(Design Rule Check) function. This is a big feature of EasyEDA. It is hard to fix DRC errors after laying out the PCB. Now EasyEDA will let you know the error in routing. You will find an X flag to mark the error. The unit follow the canvas unit. Rule: The default rule named “Default”, you can add the new rule you can rename and parameters for it. Each net can be set a rule. Track Width: Current rule’s track width. The track width can not less than this value. Clearance: The clearance of different objects which have different net. The clearance of the PCB can not less than this value. Via Diameter: The via diameter of current rule. The via diameter of the PCB can not less than this value. Such as the Hole/Multi-layer Pad’s diameter. Via Drill Diameter: The via drill diameter of current rule. The via drill diameter of the PCB can not less than this value. Track Length: The all track length of current rule. The track length of the same net track can not longger than this value. Including the arc lenghth. When the input box is empty the length will be unlimited. 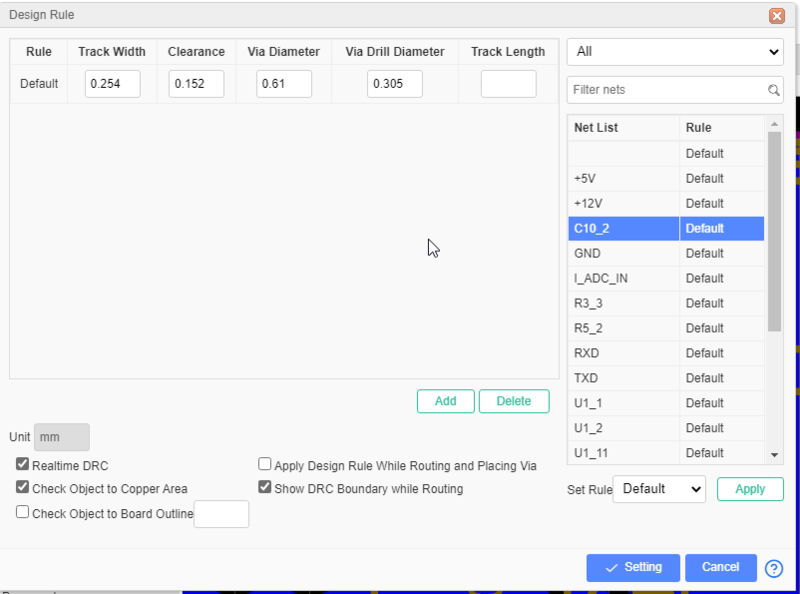 Set Rule for a Net: Select a net at the right side “Net list”, and then choose a rule at the “Set Rule” drop-down menu, and “Apply”. And dot forget click the “Setting” button to apply the setting. Realtime DRC: After enable, when you routing the DRC will checking all the time, when appear the error the canvas will show the “X” marking. Check Object to Copper Area: Check the clearance of the objects to copper area. If you disable this option, you must rebuild the copper area before generating the Gerber with SHIFT+B. Check Object to Board Outline: When you enable, you can set a value to check the clearance of the objects to board outline. Check the DRC Error: Via “Design Manager - DRC Error”, click the refresh icon to run the DRC. If your PCB is a big file, and have the copper area that will take some times to check the DRC, please wait a while. After checking, you can view all the error at the “DRC Error”, click the error the related objects will be highlighted. 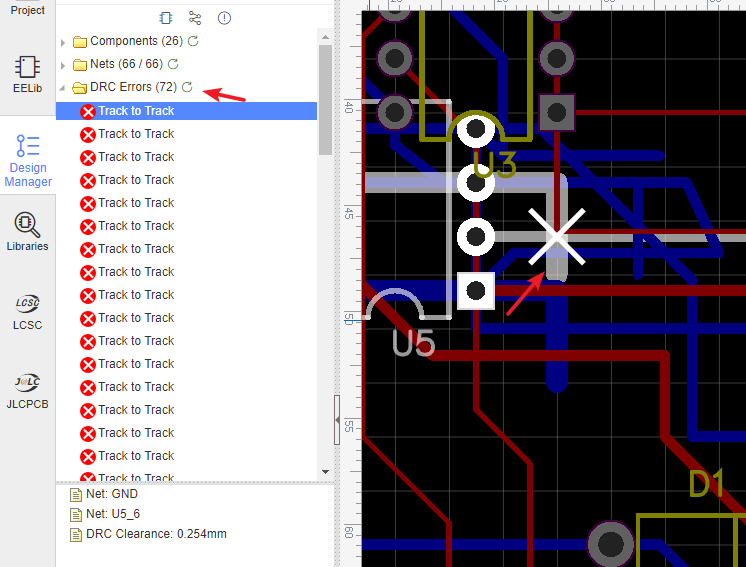 Note: When you convert a schematic to PCB, the real time DRC is open. But in the old PCB, the real time DRC is closed. you can open it as in the image above.